Gift Baskets for Vintage & Retro Collectors – Perfect Gifts! You are here: Home / Articles / Gift Baskets for Vintage & Retro Collectors – Perfect Gifts! Right about now its probably cold outside, maybe even snowing where you are and its mid December with Christmas right around the corner! Do you find yourself in a slight panic asking yourself “What gift do I give the vintage collector”? Well, we hope you find this article helpful as we have put together three gift basket ideas you can create for the vintage and retro collector you know. Vintage salt and pepper shaker collectors, vintage dog figurine and vintage teacup collectors will all be so happy to find these gift baskets waiting especially for them under the Christmas tree. 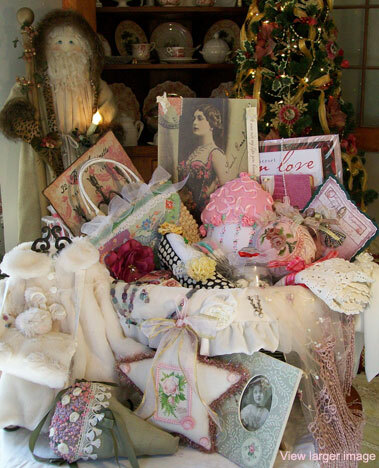 Putting together a gift basket for the vintage collector is a very personalized and unique gift that surely will be treasured! The container used for this gift basket for the salt and pepper shaker collector can be a vintage basket, vintage colander, small vintage cabinet, vintage mixing bowls, vintage loaf pans, vintage hat box, ceramics/crates, cans, tins and trays to name a few. Make sure you have an adequate amount of cellophane, netting, or tulles to completely cover the gift basket and have enough left to pull up over the basket to tie it off and secure the items. Fill the bottom of the container with shred, brown primitive papers, or vintage tea towels and napkins to cushion the contents. Have some nice bows and ribbons and items to embellish the basket like florals, ornaments, and some greenery handy. Items to include in this gift basket are of course Salt and Pepper Shakers; maybe you are able to seek out and find the rare or hard-to-find shakers your recipient is looking for. Perhaps you are very generous and can include multiple sets or a couple pairs of shakers. Also, including a collectors book specific to salt and pepper shakers that details collecting areas and manufacturers, price guides, what to sell and what to keep would be a nice addition. Adding some actual gourmet salts and peppers to this basket would be great. Maybe you are able to locate a calendar specific to salt and pepper shakers to add to the basket or have photographed the collection of shakers your recipient has and turned it into a calendar or coffee table book and can add it to this basket – that would be truly awesome! Does your recipient collect Chintz teacups, or only teacups with pink roses, bone china teacups, or a variety of teacups? No matter which type of teacup your recipient collects, you should be in luck and have no trouble finding the perfect one as teacups are everywhere and beautiful vintage and antique ones can be tracked down at antique shops, vintage shops, and even thrift stores and estate sales. The container used for this gift basket for the Teacup collector can be a vintage basket, a pretty wicker basket, vintage colander, vintage hat box, ceramics/crates, cans, tins and trays, lovely porcelain boxes, and vintage tea caddy’s to name a few. Make sure you have an adequate amount of cellophane, netting, or tulles to completely cover the gift basket and have enough left to pull up over the basket to tie it off and secure the items. Fill the bottom of the container with shred, vintage tea towels or vintage napkins, even a small vintage quilt or scarf to cushion the contents. Have some nice bows and ribbons and items to embellish the basket like florals, ornaments, and some greenery handy. Items to include in this gift are teacups! Make sure the teacup is cleaned before placing it into the gift container. Teacups in whatever pattern and style your recipient collects. If you have a treasured heirloom that you would consider passing onto a close and dear collector you know, this would be a treasured teacup to receive for certain! Adding a dainty enameled spoon or vintage sterling silver teaspoon along with a nice selection of gourmet teas, sugars and tea cookies. Adding a lovely vintage porcelain creamer and a darling little teacup ornament would be nice additions as well. Also, adding a resource like a collector’s book on teacups and china would be very nice too. Great resource here. Know someone that collects “Oodles of Poodles”? Or is she/he more of a vintage Scottie Dog collector or do they prefer collecting vintage Spaniel dogs? Whatever breed your recipient enjoys collecting, you should have no trouble spotting the right figurines for their gift basket. 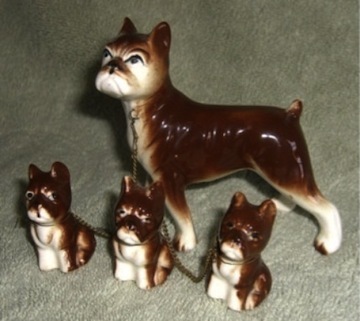 You may find a vintage 1950s chained doggy family where it is typically the mamma dog and 2-3 or more puppies together via a chain around their necks connected to mamma (super cute), or some vintage puppy dog embroidered tea towels, vintage chalkware puppy dog wall plaques, vintage poodle or Scottie dog Bakelite brooches even dog themed mugs and wall plates, shirts, bags, vases, and planters to name a few. 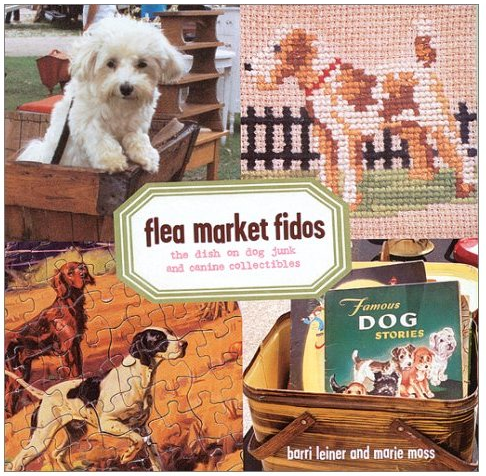 Including a dog lovers book, specific book on dog breeds, a really neat book titled “Flea Market Fido” detailing all kinds of pictures and items from a couple collectors of doggy items/memorabilia that they have come across from their many years out scouring flea markets. Your container for this neat gift basket could be a small doggy bed, small puppy dog carrier, dog themed canisters and bowls, and even a nice sturdy basket. Make sure you have an adequate amount of cellophane, netting, or tulles to completely cover the gift basket and have enough left to pull up over the basket to tie it off and secure the items. Fill the bottom of the container with shred, crumpled newspaper, crumpled puppy dog images from old calendars, even clean and unused puppy pads. Have some nice bows and ribbons and items to embellish the basket like florals, ornaments, dog bone shaped cookie cutters, and some small puppy plush toys.